In the exposition of this book, ten-year-old James “Johnny Ray” Thompson wants a dog of his own so badly, so that he could make his dog attack and scare his friends. Unfortunately, Johnny Ray’s mother didn’t want him to have a dog at their home, but his father told him that, with him, owning a dog would be okay. Since his father highly respected his mother and sided with her, Johnny Ray was faced with the challenge of finding a place to keep his dog. Later, Mr. Lambert, a good neighbor and close family friend, told Johnny Ray that he could keep his dog at his house. Fortunately, Johnny Ray was given a beautiful solid black half German-Shepherd and half Labrador-Retriever puppy by an elderly lady who lived just a few blocks away from him. He named this puppy Roscoe. After having raised this puppy, with the help of his father, into a big beautiful dog, Johnny Ray tried repeatedly, by also whipping him, but to no avail, to get Roscoe to attack his friends. As soon as he started fighting Roscoe with other dogs, he soon realized that he had raised a gentleman of a dog because Roscoe wouldn’t fight a girl dog. However, he didn’t understand this until after his daddy had explained that the average boy dog wouldn’t fight a girl dog to him. 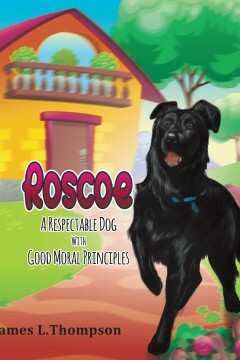 And, that Roscoe was a respectable dog toward girl dogs. So, the moral of this story about Roscoe’s life is to teach as many kids and adults as possible that no boy or man should never beat and whip a girl or a woman. James L. “Johnny Ray” Thompson was born and raised in the small town of Canton, Mississippi. After graduating from Canton Public High School, he attended Holmes Junior College which is located in Goodman, Mississippi, and from which he received an Associate of Arts Degree in General Business Administration. He later went on and attended Mississippi State University which is located in Starkville, Mississippi, and from which he received two undergraduate degrees; one in General Business Administration and one in Management.